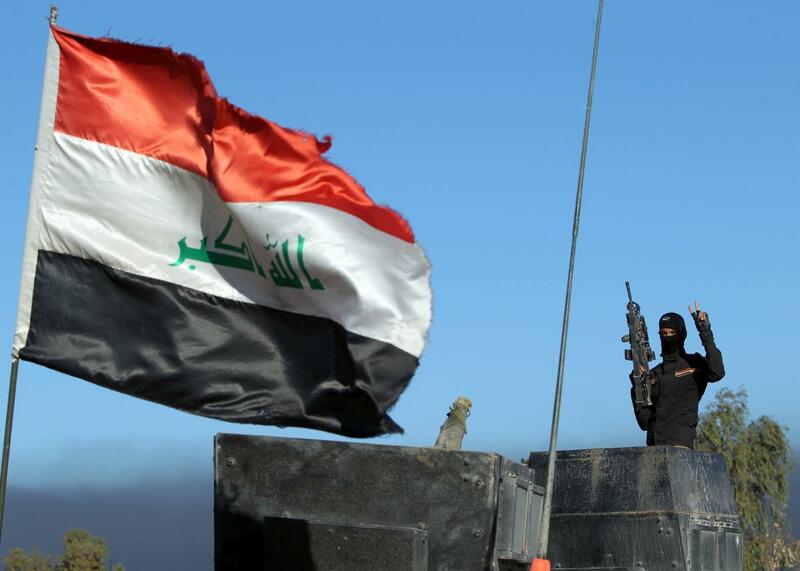 After fall of Ramadi, Iraqi prime minister promises ISIS defeat in 2016. A member of Iraq’s counterterrorism forces near Ramadi on Dec. 9, 2015. So, is there any substance to back up Abadi’s optimism? The strategy that worked in Ramadi—as Foreign Policy’s Paul McLeary described it, “mass thousands of ground troops while allowing them the time to methodically push forward under the umbrella of relentless American air power”—could serve as a blueprint for retaking ISIS’s remaining Iraqi strongholds. Next up, most likely, is nearby Fallujah, which ISIS captured in January 2014. U.S. officials had reportedly been pushing to take Fallujah, which is less well-defended, before Ramadi. But the Iraqis felt that a victory in Ramadi, the capital of Anbar province, would be symbolically important and would isolate Fallujah, making it easier to win the fight there. The most significant battle to come will be Mosul, Iraq’s second largest city, where ISIS leader Abu Bakr al-Baghdadi declared his “caliphate” last summer. Mosul is thought to be extremely well-fortified and defended by far more ISIS fighters than any of the cities retaken so far. As I wrote last week, the fact that Ramadi was retaken after seven months of ISIS occupation is almost less important than who retook it. The final battle was carried out primarily by Iraqi government forces—with significant help from U.S. airstrikes—rather than by the Shi’ite militias that have been responsible for other recent victories against the group. These militias, which have been accused of significant human rights abuses, were thought likely to antagonize the population of the primarily Sunni city. The U.S. has also been reluctant to be seen as cooperating too closely with these Iranian-backed groups. After its near collapse at the hands of ISIS last year, the Iraqi army, under heavy influence from U.S. trainers, has shifted its focus from the counterterrorism and counterinsurgency operations that were so prevalent in the last decade to more conventional battlefield tactics. This has been done in order to more effectively fight an enemy that often resembles a traditional state military more than a terrorist group. That it took so long to make this evolution isn’t the first time that a military has been caught trying to fight the last war, but one counterinsurgency lesson that the Iraqis will hopefully not unlearn is that ISIS will never be defeated without the support of Sunni civilians. Abadi is saying the right things, promising that once Ramadi is secured, it will be turned over to local police and a Sunni tribal force. In integrating this population back into the Iraqi state, it remains to be seen whether he will avoid the mistakes of his predecessor, Nouri al-Maliki, who marginalized Sunnis from power and cracked down on their political activities to the point that ISIS was able to virtually stroll into Mosul without resistance. Iraq’s finance minister, Hoshiyar Zebari, also conceded Tuesday that Iraq would not be able to retake Mosul without help from Kurdish forces. The Kurds have racked up a number of significant victories against ISIS, including in the town of Sinjar, which, it is hoped, will cut supply lines between Mosul and ISIS’s de facto capital in Raqqa, Syria. But Baghdad is wary that the fighting will allow Kurdistan, which has hopes for full independence, to acquire more territory and bolster its autonomy. Combine the increasingly independent Kurds with whatever political concessions the Shiite-led government will have to grant Sunnis to tamp down militancy, and it’s also possible that Abadi could succeed in kicking ISIS out of the country only to find that he doesn’t have much of a country left.